4-Way Flipper Racks with Tray Multi-tube compatibility. Four 4-way racks in a convenient tray. Each Flipper can be independently oriented. 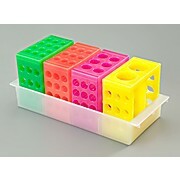 4-way rack can be used either in the tray or independently. Standard or fluorescent colors.